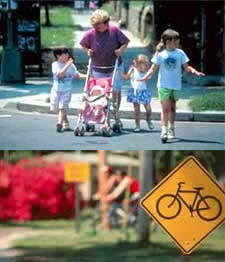 Livable communities that support bicycling and walking are a high priority of the U.S. Department of Transportation. A livable community is one that provides safe and convenient transportation choices to all citizens, whether it's by walking, bicycling, transit, or driving. Each year, unfortunately, pedestrian and bicyclist fatalities comprise about 16 percent of all traffic fatalities with approximately 5,000 pedestrian deaths and 800 bicyclist deaths. Another 65,000 pedestrians and 48,000 bicyclists are injured in roadway crashes annually. These numbers have been rising recently and this is unacceptable. Pedestrian and bicyclist safety improvements depend on an integrated approach that involves the 4 E's: Engineering, Enforcement, Education, and Emergency Services. The FHWA's Office of Safety develops projects, programs and materials for use in reducing pedestrian and bicyclist fatalities. All of these materials can be found here.